I'd had the body fabric in the stash for years and I just picked up the dots as a remnant because I knew they would coordinate with the other one. There is a layer of heavy duty canvas lining the outside layer. It gave the bag some nice body and it will help considerably with durability. I'm glad I went with it instead of just using interfacing because it really wasn't any more work. The flap does have single side fusible interfacing between the two layers. Before we left, I picked up the roll of wide dark brown grosgrain ribbon and D rings at Joann's and grabbed elastic and zippers from the stash. (That's right, I had two dark green zippers in the stash from Grandma that matched the fabric.) Yesterday, we headed into Springfield to Econosales and got the webbing and hardware for the strap. I love the way the "real" strap makes it look professional. My favorite part of this project was the freeform creative process. I used the 8th grade bag to get the front/back/flap pattern template and decided in advance what pockets I would want and where and then just approached each challenge as I came to it. There's a strip of brown grosgrain centered along the entire side/bottom gusset, which I used to affix the D rings. On one side I added the water bottle pocket. It was pleated at the bottom and has 1/4" elastic run through a casing at the top. The canvas and circle fabric for the front panel had to be cut 1" too tall and were then cut apart to install the zipper. The last of the dot fabric was pieced to create the pocket back and stitched to the back of the zippered section before the whole panel was sewn into the body of the bag. The construction of the inside pocket is pretty self explanatory and it was sewn to the lining panel before the lining was sewn together. I love how cunningly these bags are constructed. After all of the panels have had any modifications made to them (pockets, decoration, etc. ), the flap is sewn right sides together, turned, pressed and topstitched around the edge. 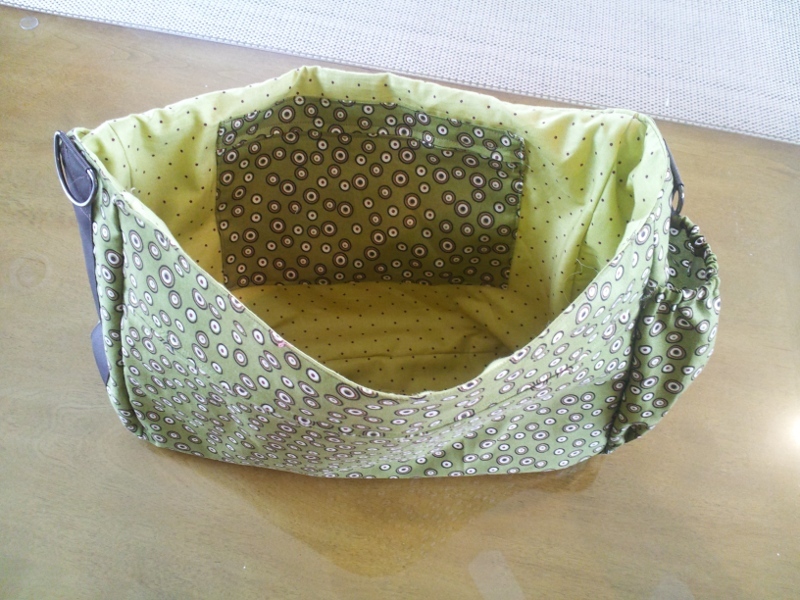 The outside is sewn into a bag shape and the flap is sewn to one top edge. The lining is also sewn into the bag shape, leaving a few inches of gap in one of the bottom seams. 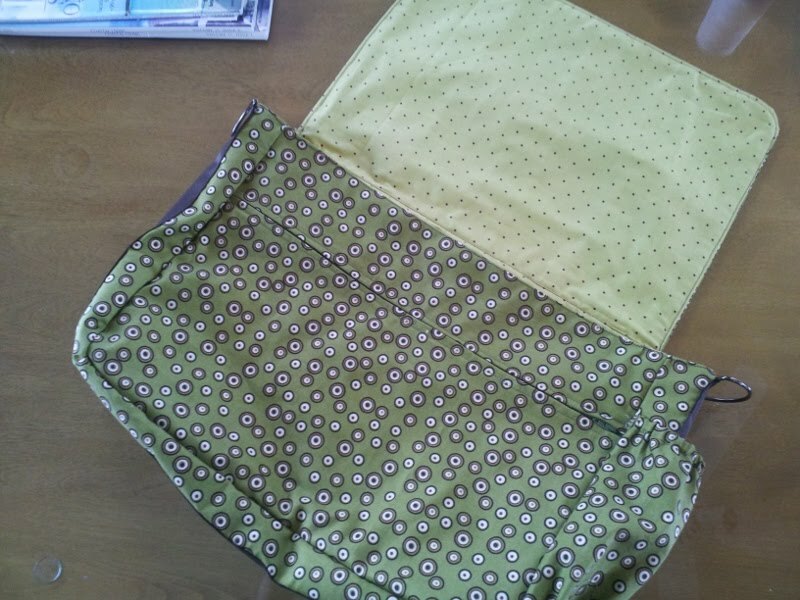 Finally, the lining and the outside are sewn together around the top with right sides together and the whole bag is turned inside out through the gap in the lining. After the lining whole is blind-stitched closed, it kind of seems like magic allowed the bag's construction. The last step is topstitching around the top edge of the bag. I want to get some coordinating waterproof fabric and make a travel wet bag like this. I'm planning on getting a single package of commercial wipes, like these, so I can use the box when they're all used up and probably cover it, like this (sans yoyo). Using the serger to whip up some flannel rectangles to use as reuseable wipes is on the to-do list. The Lusa Organics Baby Wipe Juice we ordered came today and it smells fantastic! Assuming it works as well as everyone seems to think it does, I'm excited to try it. It seems well worth the indulgence of not making my own. A friend will be dropping off a variety box of small used diapers soon and we're also planning on trying Ruby's Diaper Service. I'd like to take on laundering my own but I think using a service in the beginning will make our first weeks a little easier. I've got some calendula infused oil that I made last summer and am going to make some calendula cream to have on hand for any rash. I'm waiting on my vitamin E in the mail. Definitely go with the snappies. They are easy and work wonders (plus you never stab the baby) :). The only challenge is that they sometimes get worn out, or lost. I've also had to purchase more for sizing issues. Worth the money though. Good luck with everything! We use a cloth diaper service, and it really cuts down on a lot of extra chores (we still do plenty of laundry for the covers). It also is a local business so we feel good about that. Basil - 3 3/8 oz. Beans, Scarlet Emperor - 1# 4 1/8 oz. Beans, Violet Podded - 8# 2 7/8 oz. Beet Greens - 3# 8 oz. Beets, Chioggia - 4# 9 oz. Beets, Golden - 5# 11 oz. Broccoli - 14# 12 oz. Carrots - 12 1/8 oz. Corn - 29# 7 7/8 oz. Eggplant - 32# 3 7/8 oz. Garlic scapes - 1 1/2 oz. Ground cherries - 1# 4 1/4 oz. Melon - 4# 5 1/4 oz. Onion, Yellow - 10# 1/4 oz. Peas - 6 5/8 oz. Pepper, Green - 19# 12 oz. Peppers, Anaheim - 30# 4 5/8 oz. Peppers, Arroz Con Pollo - 2 1/2 oz. Peppers, Jalapeno - 1# 3 7/8 oz. Peppers, Sweet Lipstick - 7# 1 oz. Pie cherries - 8 oz. Rhubarb - 2# 15 1/4 oz. Squash, Acorn - 13# 10 1/4 oz. Squash, Butternut - 10# 1/2 oz. Squash, Dumplling - 9# 12 1/8 oz. Squash, Pumpkin - 8# 13 3/8 oz. Squash, Yellow 14# 1 7/8 oz. Tomatoes, Amish - 49# 5/8 oz. Tomatoes, Cherry - 21# 5 3/4 oz. Tomatoes, Nova - 46# 13 1/8 oz. Tomatoes, Siletz - 15# 13 oz.